For full instructions on How to Use the Fall Line Putt Reader (FLPR), click here to download PDF file. For information on the Important Features of the FLPR, click here to download PDF file. For Product Details on the FLPR, click here to download PDF file. For Additional Facts on Putt Reading, click here to download PDF file. The slope of the green surface at the hole is the biggest single factor in how a putt will break. 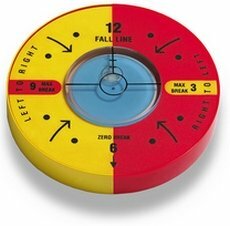 It determines if the ball rolls right to left, left to right, or straight. Find the fall line, and you are well on your way to making the putt. The average golfer has trouble in determining which way the ball will break at the hole. Faster green speeds have added to this difficulty, as they tend to multiply any error in the judgement of distance and break. The ability to judge the slope at the hole allows you to putt with greater confidence and commitment to your line. Indecision about which way the ball will break undermines your confidence and leads to a tentative stroke. The most common putts are in the range of 4 to 5 feet with some break to them. They are the result of chipping from off the green, and from a long putt while on the green. Most of these putts are makeable, but are missed as a result of a misread.